Oatmeal date cookies - less fat and more nutrients - healthy! I absolutely love oatmeal cookies for dessert … the wholesome taste of the grains, plump fruits like dates or raisins, and walnuts are absolute heaven right from the oven. 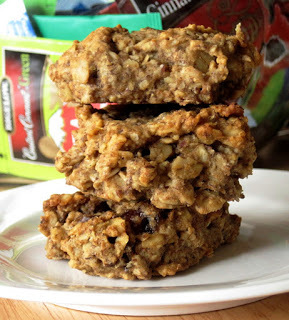 So, when I wanted a healthier cookie, I came up with this recipe for oatmeal date cookies. Always looking for ways to make my baked goods even healthier, I wanted to eliminate saturated fats and preservatives, while adding nutrients to enhance the value of the end result. Now, the catch is to create a baked item that is still delicious. I mean if someone says healthy cookie, what comes to mind usually is a bland, hard, cardboard tasting, throw in the trash while no one is looking cookie. Am I right? I SAY WRONG. Recently, I discovered that organic Extra Virgin Coconut Oil yields a light, moist cookie. I played around with this recipe and have come up with what I think is the closest to “I Can’t Believe This Does Not Have Butter” oatmeal date cookie. And, if you prefer, you can substitute raisins for the dates. Also, it’s very simple to put a batch together without mixers. Just grab a couple of bowls and a large spoon and let’s get baking. Preheat oven to 350 degrees. The coconut oil will be firm at room temperature, so while you are getting things together, place the 1 cup coconut oil in an oven safe bowl (I use the wet ingredient bowl and careful handling the bowl when you remove from the oven) and melt the oil to very soft or liquid (this process does not take long). Place the rest of the wet ingredients in the large wet ingredient bowl containing the coconut oil, and whisk until well blended. In the other bowl, place the flours, flax meal, baking powder, soda and cinnamon and fork until well blended. Add the flours to the wet ingredients and stir until well combined. Add the old fashion oats and stir until well combined. Add the dates or raisins and optional walnuts and stir until well combined. Drop by tablespoon onto un-greased cookie sheet and bake for approximately 10 minutes.